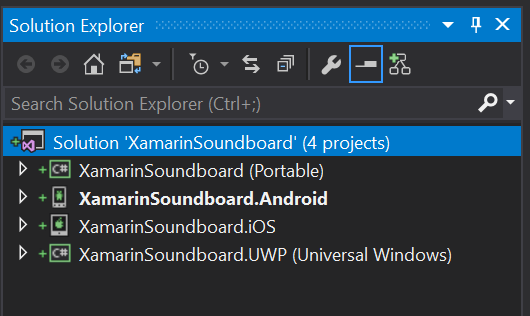 I did one for iOS native with Xcode, Android native with Android Studio, and a web-based solution using Visual Studio with .NET, and now I’m going to create a cross-platform soundboard using Xamarin Forms (for iOS, Android, and UWP). 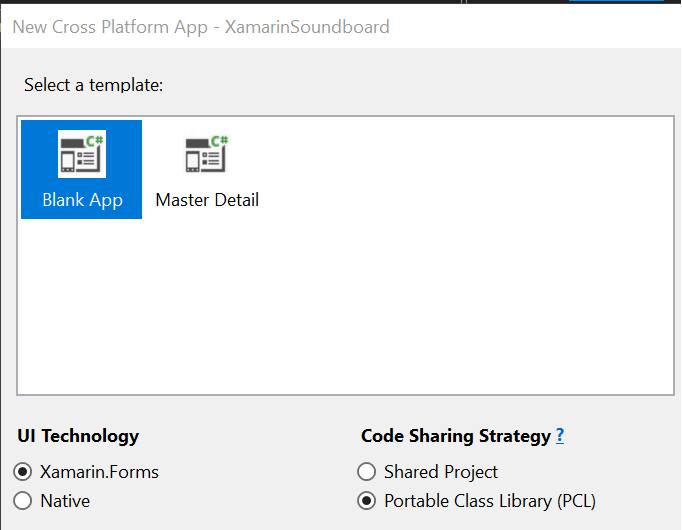 I plan to go through the entire process in a way that anyone new to Xamarin development will be able to follow step-by-step and have a working application by the end of these posts. An important thing to bear in mind with is that the code probably won’t be perfect and there will most likely be multiple different ways to reach the same goal (and some of the other ways could be better than the one I’ve chosen). 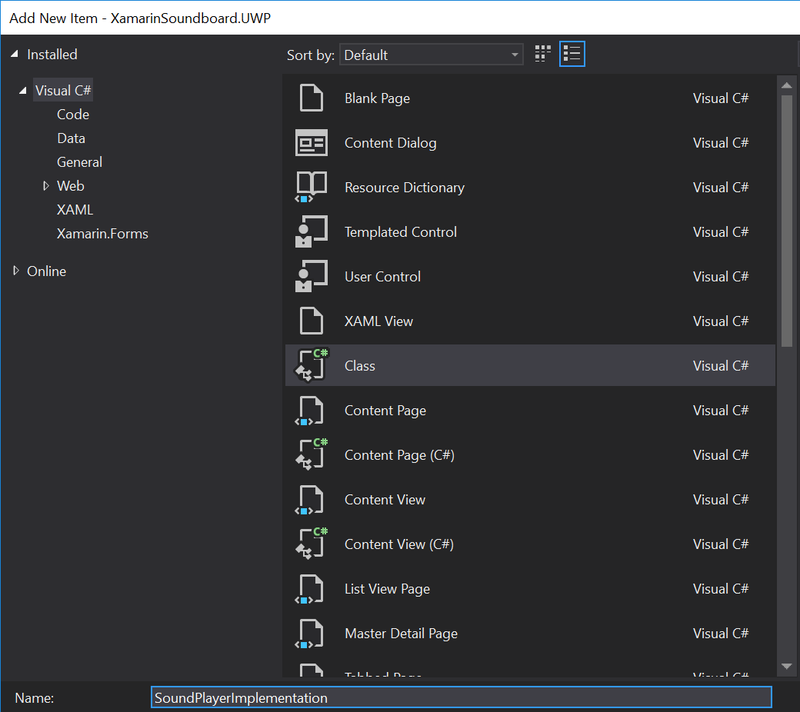 On the next project wizard screen, we’ll create it as a Blank App using Xamarin.Forms and with a Portable Class Library (PCL) (NOTE – I would normally recommend going with a Master Detail project and leveraging MVVM, but I want to keep this one very simple and basic). 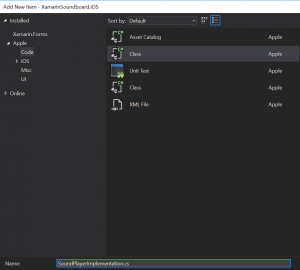 At this point, Visual Studio will churn for a bit as it creates all the necessary projects for your new Xamarin.Forms solution, relax and let it do its thing. Eventually, you will be prompted to select the version details for the Universal Windows Project (UWP), I’ll leave them at the defaults it pre-selects for me. 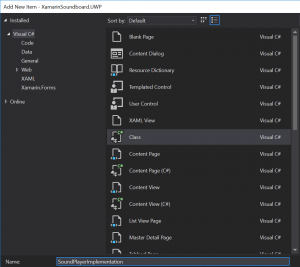 Once you select your targets, Visual Studio will do some more processing to finishing setting everything up for you. When it is finished, you’ll be presented with a solution that contains your PCL, Android, iOS, and UWP projects. 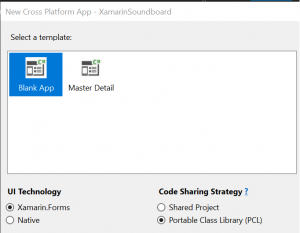 At this point, I’m going to deviate for a moment to discuss a key bit of knowledge that you’ll want to have at least a passing understanding of if you plan to do much with Xamarin and cross-platform development: the DependencyService. We’ll start with the easiest interface first, because it’s the easiest interface… In the case of the soundboard, the simplest interface will be the one that handles playing a sound file. Right click on the Portable project at the top of your solution and then select Add -> Add New Item. 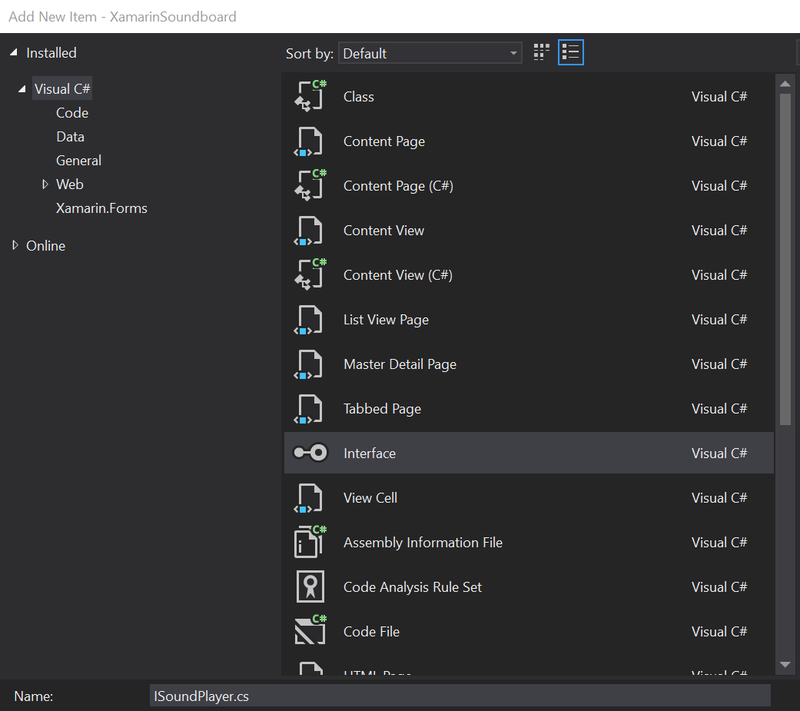 From the list of templates, select Visual C# -> Interface and give it a name of ISoundPlayer.cs. Add an accessor for the interface to make it public, and give it a single void method named PlaySoundFile that takes a single string parameter named fileName. That’s it for the interface, told you it would be easy! Now we need to create a class for each platform that implements the interface. 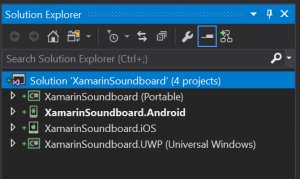 For our purposes here, we’re going to assume that we will be including the sound files in each of the platforms native ways: Android and UWP will have them as assets and iOS will have them as bundle resources. This means that we’ll end up having multiple copies of them in our solution, and there are options available to prevent having to do that, but that will be for another post. Going from top to bottom in our solution, we’ll create the Android implementation first (lucky for us it is also the simplest of the three). 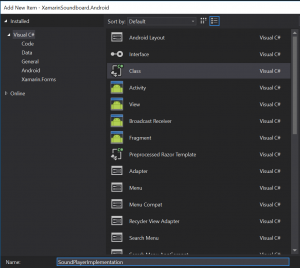 Right click on the Android project in the solution and select Add -> Class and give it the name SoundPlayerImplementation. 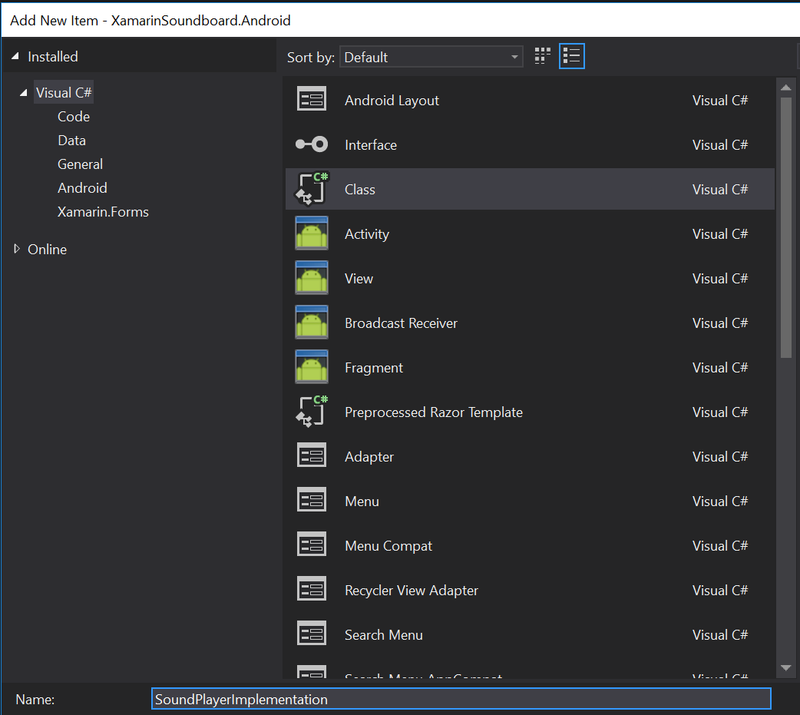 We want to add the public accessor to the new class, wire it up to the interface we created in the PCL (ISoundPlayer), and then implement the audio playback functionality for Android. Rather than use words to explain the implementation, I’ll just provided the actual code with a bunch of comments included. Key items to note are the metadata instruction that registers our class to the DependencyService and the implementation of the interface we created in the PCL. 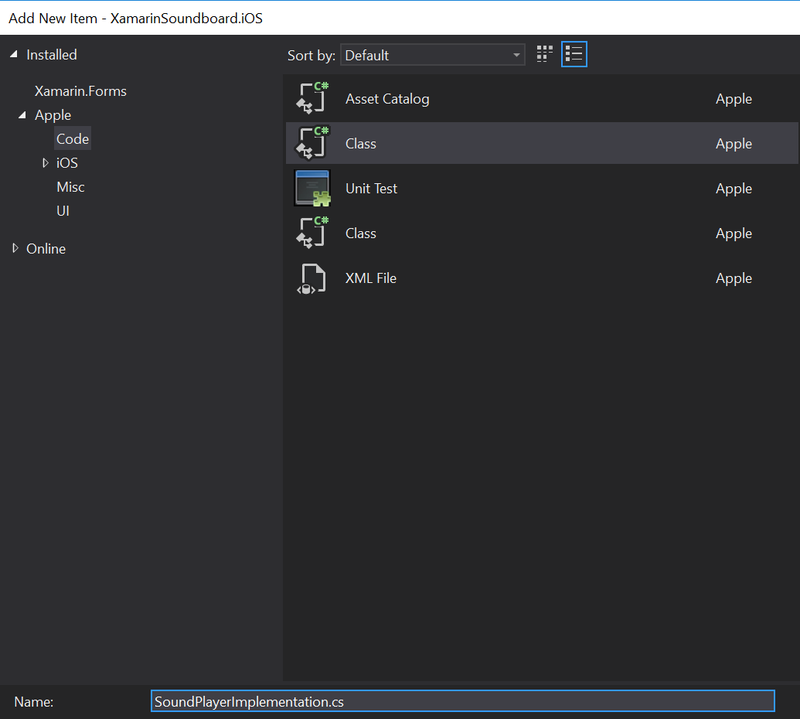 Next, we’ll create the implementation file for iOS – right click on the iOS project then choose Add -> Class and give it the same name of SoundPlayerImplementation (the namespaces will take care of keeping them unique for us across the solution). Just like with the Android implementation, we want to add the public accessor to the new class, wire it up to the interface we created in the PCL (ISoundPlayer), and then implement the audio playback functionality for iOS. There is a little bit more to the code in iOS, mainly because of how we will instantiate the audio player from the resource bundle. The code and comments will explain it better than I could type it back out. 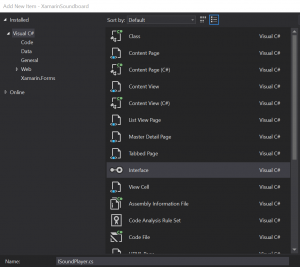 Finally, we’ll create the implementation class for UWP – right click on the Universal Windows project then choose Add -> Class and give it the same name of SoundPlayerImplementation. All the same words that I used about Android and iOS up above apply here, and then the code explains the rest. // Make sure to put in the actual file name of your MP3 file -- It is case sensitive! And that’s it, now you can run it on each of your platforms and you’ll be presented with a full-screen button with the text Sound on it. Clicking that button on any of the platforms will cause it to play the MP3 file that you added to your project. That’s it for part 1, you should now have the base project created and be able to run a program that will display a gigantic button that plays an embedded MP3 file upon being clicked on each of the target platforms!